Crofts Estate Agents are pleased to bring to the market this executive SIX BEDROOM DETACHED property located in the popular village of Ulceby. Gower Lodge was built in 2016 and boasts a corner plot location in which it has front and rear gardens plus a DOUBLE GARAGE. The property is set over three floors and is finished to a high spec throughout. 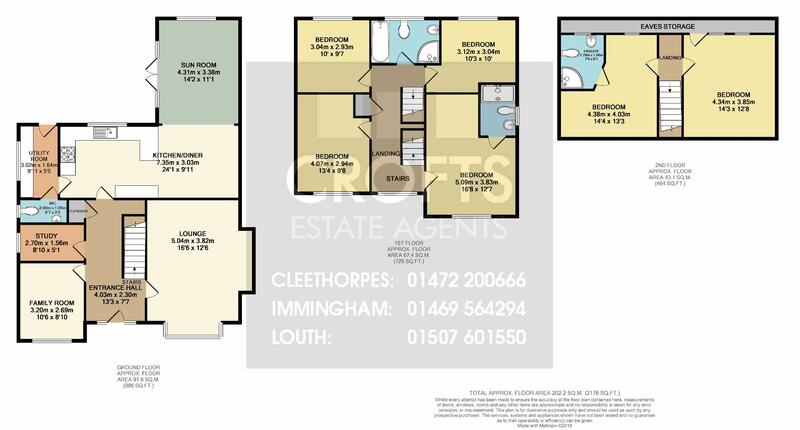 The ground floor layout comprises of; Entrance hallway, lounge with log burner, family room, study, utility room, W/C and a kitchen diner with a rear sun room. The first floor has four double bedrooms and an ensuite to the master bedroom, the family bathroom with boasts a four piece suite is also located on this level. The top floor has two further double bedrooms, one of which has its own ensuite shower room. Viewings come highly recommended. Included in the the price, carpets, blinds, light fittings. This stunning executive property was only built in 2016, so is still a new build property. With its attractive brickwork and overall size, this house stands out from the road side and has plenty of off road parking plus a double garage. The main lounge in the property is located to the front of the house and has a bay window to the front, which allows a good amount of daylight to enter the room. The key feature of this room is the large open bricked fire hearth which is finished off nicely with a log burner. Neutrally decorated throughout. The family room is located on the opposite side of the hallway to the lounge. A nice sized room which could be utilised as a dining area, childs playroom or office. Neutrally decorated to a high standard as is the rest of this property. The utility room is located through the kitchen and has a door leading onto the back garden. The boiler for the property is located in this room and there are plumbings for washing machines etc. The W/C is through a door from the utility room and provides the ground floor with a downstairs toilet and wash basin. The open plan kitchen diner is a key selling point of the house. There is an ultra modern handleless kitchen which has a range of wall and base units plus a high end quartz worktop running throughout. Other features of this room are the double oven, integrated dishwasher, integrated fridge/freezer, fitted microwave oven, inset gas hob with extractor above. L.E.D. base unit lights. The sun room is located at the rear of the property and is located through the kitchen dining room. An all year round room with double doors onto the back garden. White neutral modern decor. Vertical blinds. The first of the bedrooms is located to the front of the property on the first floor and its classed as the master due to it having a really good sized ensuite. The room is a brilliant double size and is an L shape bedroom. The ensuite has a walk in shower unit, wash basin and toilet. The second bedroom is located on the first floor and faces out onto the front of the property. Another neutrally decorated room which is a double in size. The third of the bedrooms is located to the rear of the house and is a lovely double sized room which overlooks the back garden. Neutrally decorated throughout with a rear uPVC window and gas central heated radiator. The fourth bedroom on the first floor is currently being used as a home office. A generous sized room which looks out over the back garden. Neutral decor and a rear uPVC double glazed window. The fifth bedroom, located on the top floor of this house, is a double sized room and has a Keylite window which gives views over the fields to the rear. A really cosy room, big enough for a king size bed. Offering neutral decor throughout. The sixth bedroom is located on the top floor and benefits from having its own ensuite shower room. The room is currently being used as a dressing room for the fifth bedroom, however it is still plenty big enough for a double bed. This room has a Keylite window, as does the ensuite which provides the bedroom with a corner shower unit, toilet and wash basin. The back garden is a lovely private space. To the boundary there is a bricked wall and the double garage is located to the rear of this space. The garage provides secure off road parking for two cars, or provides extra storage. There is very good levels of off road parking in front of the garage doors. Ample parking on the drive, space for three cars.